German rabbi and author, and one of the leaders of modern Orthodoxy; born at Carlsruhe March 17, 1798; died at Altona Dec. 7, 1871. He received his early education from his father Aaron, who was "Klausrabbiner" at Carlsruhe, continuing his studies under Abraham Bing at Würzburg, where he also attended the university. He was thus among the earliest German rabbis who possessed academic training. In 1826 he was appointed "Kreisrabbiner" of Ladenburg, with his seat in Mannheim, where he was at the same time chief prebendary ("Klausprimator"). This position he held until he was called as chief rabbi to Altona, where he officiated from 1836 until his death. In this position he became one of the most prominent representatives of German Orthodoxy, which stood for the union of secular learning with strict adherence to the tenets and practises of traditional Judaism. A typical story is reported by Abraham Geiger, who formed Ettlinger's acquaintance as a student in 1829. 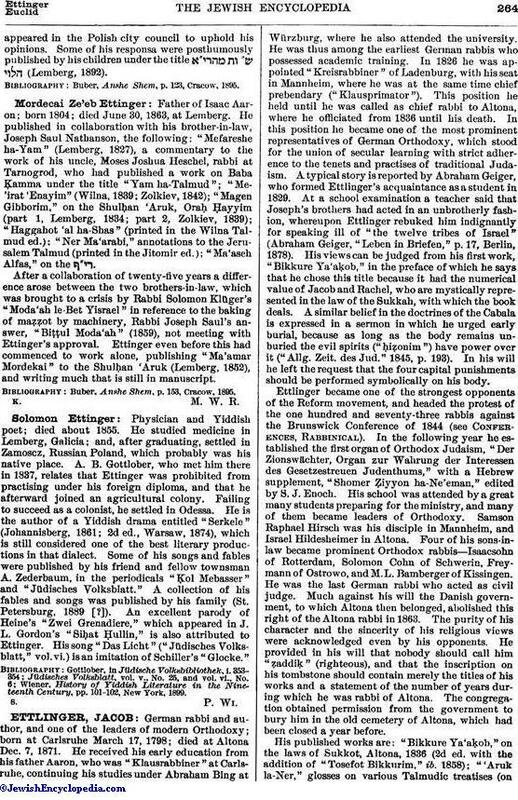 At a school examination a teacher said that Joseph's brothers had acted in an unbrotherly fashion, whereupon Ettlinger rebuked him indignantly for speaking ill of "the twelve tribes of Israel" (Abraham Geiger, "Leben in Briefen," p. 17, Berlin, 1878). His views can be judged from his first work, "Bikkure Ya'aḳob," in the preface of which he says that he chose this title because it had the numerical value of Jacob and Rachel, who are mystically represented in the law of the Sukkah, with which the book deals. A similar belief in the doctrines of the Cabala is expressed in a sermon in which he urged early burial, because as long as the body remains unburied the evil spirits ("ḥiẓonim") have power over it ("Allg. Zeit. des Jud." 1845, p. 193). In his will he left the request that the four capital punishments should be performed symbolically on his body. Ettlinger became one of the strongest opponents of the Reform movement, and headed the protest of the one hundred and seventy-three rabbis against the Brunswick Conference of 1844 (See Conferences, Rabbinical). In the following year he established the first organ of Orthodox Judaism, "Der Zionswächter, Organ zur Wahrung der Interessen des Gesetzestreuen Judenthums," with a Hebrew supplement, "Shomer Ẓiyyon ha-Ne'eman," edited by S. J. Enoch. His school was attended by a great many students preparing for the ministry, and many of them became leaders of Orthodoxy. Samson Raphael Hirsch was his disciple in Mannheim, and Israel Hildesheimer in Altona. Four of his sons-in-law became prominent Orthodox rabbis-Isaacsohn of Rotterdam, Solomon Cohn of Schwerin, Freymann of Ostrowo, and M. L. Bamberger of Kissingen. He was the last German rabbi who acted as civil judge. Much against his will the Danish government, to which Altona then belonged, abolished this right of the Altona rabbi in 1863. The purity of his character and the sincerity of his religious views were acknowledged even by his opponents. He provided in his will that nobody should call him "ẓaddiḳ" (righteous), and that the inscription on his tombstone should contain merely the titles of his works and a statement of the number of years during which he was rabbi of Altona. The congregation obtained permission from the government to bury him in the old cemetery of Altona, which had been closed a year before. His published works are: "Bikkure Ya'aḳob," on the laws of Sukkot, Altona, 1836 (2d ed. with the addition of "Tosefot Bikkurim," ib. 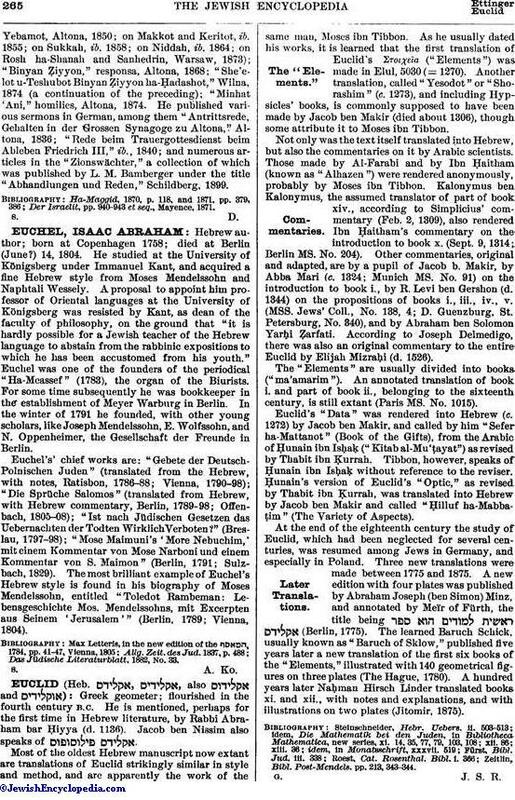 1858); "'Aruk la-Ner," glosses on various Talmudic treatises (onYebamot, Altona, 1850; on Makkot and Keritot, ib. 1855; on Sukkah, ib. 1858; on Niddah, ib. 1864; on Rosh ha-Shanah and Sanhedrin, Warsaw, 1873); "Binyan Ẓiyyon," responsa, Altona, 1868; "She'elot u-Teshubot Binyan Ẓiyyon ha-Ḥadashot," Wilna, 1874 (a continuation of the preceding); "Minḥat 'Ani," homilies, Altona, 1874. He published various sermons in German, among them "Antrittsrede, Gehalten in der Grossen Synagoge zu Altona," Altona, 1836; "Rede beim Trauergottesdienst beim Ableben Friedrich III," ib., 1840; and numerous articles in the "Zionswächter," a collection of which was published by L. M. Bamberger under the title "Abhandlungen und Reden," Schildberg, 1899. Der Israelit, pp. 940-943 et seq., Mayence, 1871.